We love the beginning of May because the final projects for college coursework start rolling into our tips line. 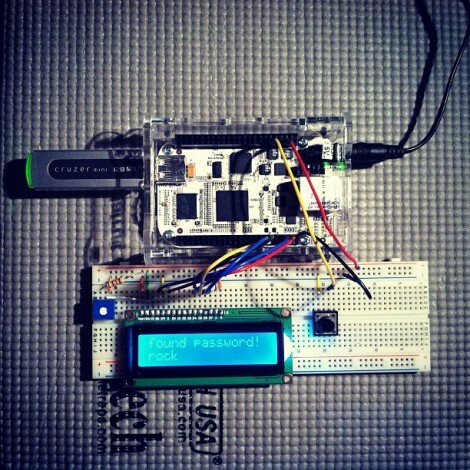 Here’s one of the latest, it’s an automatic Master lock combination cracker which was built by [Ross Aiken] and his classmates as part of their ECE453 Embedded Microprocessor System Design class at the University of Wisconsin – Madison. We’ve talked about the ease with which these locks can be cracked. But [Ross] points out that the resources we linked to before are flawed. To get the combination as quickly as possible the team has implemented an algorithm discussed here. Their machine uses a stepper motor to turn the dial with a big solenoid to pull on the shackle. The system is sensitive enough to detect the “sticky” spots of the lock, which are then used to narrow the number of possible combinations before brute forcing the combination. As you can see in the video after the break, the shackle moves slightly when pulled after an incorrect combination. The long vertical pin near the solenoid will pass through an optical sensor when the correct combination is found. Do you have your own final project to show off? What are you waiting for, send us a tip about it! For most people, forgetting the combination on a lock means breaking out the bolt cutters and chopping off the lock. 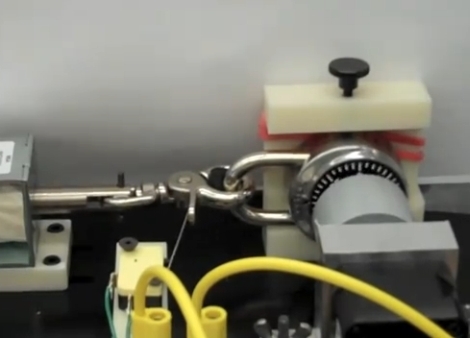 Some students at the [Olin College of Engineering] decided there was a far more elegant way to do the job, so they built an automated lock-cracking machine. The machine consists of a clamp to hold the lock, a solenoid to pull the lock open, and a stepper motor to run through the combinations. Most of the processing is done on the attached computer, using software they created. The application will brute-force all of the possible combinations if you request it, but it also allows you to enter the first, second, or third numbers of the combination if you happen to remember them. Once the machine is started, the motor begins spinning the lock and the solenoid yanks on the latch until the combination is discovered, which takes a maximum of about two hours to complete. The opening of the latch trips a limit switch and causes the mechanism to stop. A simple button press then returns the lock’s combination to the user. Be sure to check out the video embedded below of the lock cracker in action.